When I saw this low-cost low-tech simple yet extremely useful Product design – I was quite amazed as to why have we not seen it as yet. It would have saved back aches of thousands, if not millions of people who carry / push load on daily basis. 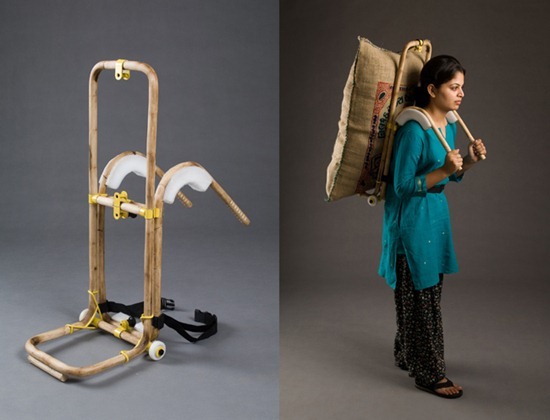 In a contest arranged by Core77, the product – Load Carrier for Labor – designed & created by Vikram Dinubhai Panchal of The National Institute of Design (NID), Ahmedabad won in the product / equipment category! This winning product was made at a miniscule cost of Rs. 300 and has potential to affect lives of millions of people across the globe. 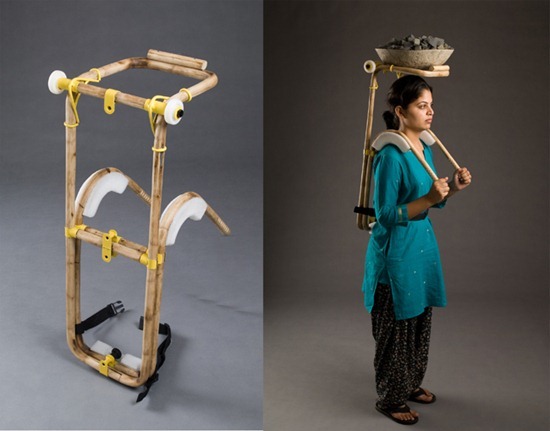 “Load carrier for labor” project aims to improve the working condition of labourers and workers at many places globally like construction site, factories, ports, railway stations, etc The objective is to prevent various occupational hazards and demonstrating Product design and ergonomic consideration in welfare of human life. Won’t this Rs. 300 product be a dream come true for labourers who carry heavy loads day-in and day-out. This is the Real grass-roots innovation! You can check out the details of this product by visiting their product page. 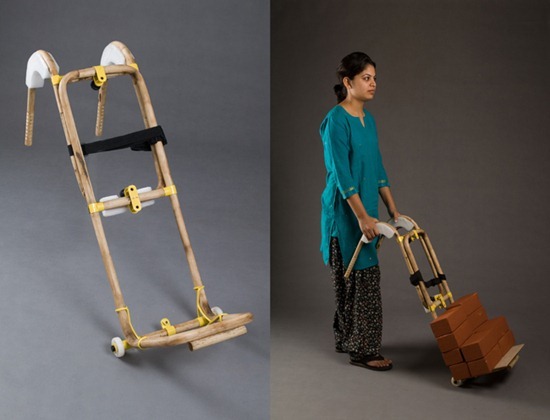 "The Real Grass-roots Innovation by Indian wins Best Product Design! ", 5 out of 5 based on 1 ratings. okay type nathing super…just a utility Insight. Amazing. Our school kids may have a use for this! Nice idea, wonder how it looks like after a few years of (heavy) use ;-) and also wonder how it will compete with new small innovative lorries. Any comment on this? That will work great in Africa. Needs bigger wheels and field trial. coming to airports near you! just superb , I hope it reaches to people who can use it on daily basis. Really nice, very happy to see that somebody also trying to boom our farmville and others. simple nd nice, I think construction people shuld make use of it..
nice innovation.. simple but very worthy. Real nice! Hope it becomes a reality – though slightly bigger wheels may be better. Excellent talent! “Lifesaver” for many people around the world! Rated -AAA +++++. Best product for labor and better one for poor indian school kids… Change india, change parents perceptions. awesome…best things in are world are always simple and efficient. Scuh a goodwork! But it il surely have issues with wheel size. Whatsoever its a masterpiece. That’s just great. just imagine how this will change the life of labors. The Reeeaaaallll Innovation.. Hats off.. abundance of talent in India but what about support and encouragement for them? Guess not we should make it available Easily , so that people can use it. “Mathyawarche jadd zaleyyyyyy oozheee”…..arey maag heee pushcart vapra….zakhasss..VCs r u listening? All cheers to you Vikram dhinubhai Panchal…. I simply have no words to praise your Genius. I am not sure how this is innovative, but respect for the initiative to put all the features of External Frame Backpack together with trolley. Most suitable to Indian working conditions, need based innovation in material handling/lifting system at minimum cost, certainly to be admired & welcome by Indian labors as a convenient equipment. Really innovative! I like it. it is a effective. I want to know that who has made it/resource person please. This is really heartening to see such a simple yet powerful innovation capable of effecting lives across the globe……i m willing to invest my time and energy in to this! simple yet very useful innovation. Wonderful and so simple innovation! Bravo! superb! very useful innovation for the labourers.it will be nice if it comes to the practical life as early as possible. its simple to look! bt really helpful….. elegant…thnxxx theee 4 your great mind. Great Innovation! Simple and effective. this is very similar to a dolly we use at school to lift classroom furniture; comes in pretty handy. Great innovation! simple thing essential for innovation……. I need one..samsaara bharam moyadaniki..hh. The great example of “Thinking out of the box”. that’s a great design, will help a lot to the workers at construction sites. Awesome…Very simple and mind blowing. aka The External Frame Pack… It’s a nicely designed one, but its funny how “Old” is “New”. Mine is 40 years old, made of aluminum, has the wheels but not the overhead, and the bottom folds out of the way when you need to store it. Simple as well as elegant design…beyond expectations. Truly amazing! Why didn’t we think of this before! Kudos @Vikram Dinubhai Panchal! We see a lot of innovations coming out of India, however most of them hit a bottle neck, when it comes to commercialization. A brilliant effort, nevertheless! Great thinking, needed badly especially in the hills! The point is when do we see it hitting the market? When does this Rs 300/- thing become visible on the roads being used by those in need? Innovation doesn’t have to be complicated; it can be as simple as this..
Great Innovation. Congrats to Khemji bhai, Prof Anil Gupta and Prof Panchal for bringing such an innovation. problem are the wheels , -Indian roads aren’t good enough – got to have 4×4 type wheels. nice to see innovative products for common man. I am very happy that khemji bhai’s idea of panihari which was taken up for value addition at NID through gian and nif;s grids has been taken so much forward by prof Panchal, keep it up, we are happy that these problems are getting attention fo designers at long last. That’s the beauty of India Engineering. it’s cheap, useful and usable by everyone. very simple, uncommon product design, very useful, easily produce-able, at low strain & high output giving design…… excellent !!!!!!!!!!! really appreciable invention by. WOW, looks great… good to know that innovation are focused on these areas……. problem are the wheels , -Indian roads aren't good enough – got to have 4×4 type wheels. It certainly seems useful and amazing, but we can’t really say if it would be a success, until we put it out in the market or ask 30-40 laborers to use it. I am very happy that khemji bhai's idea of panihari which was taken up for value addition at NID through gian and nif;s grids has been taken so much forward by prof Panchal, keep it up, we are happy that these problems are getting attention fo designers at long last. Very nice innovation…It's very helpful for Construction site.. They should make a heavy duty version for the coolies in Shimla — it was always frightening to see those men carrying all kinds of huge loads. This is very good indeed sir. Brig Ganesh Pogula had pointed out a number of issues with the existing design and this seems to have tacked a number of them, successfully..! Innovation doesn't have to be complicated; it can be as simple as this..
great, the best I have seen of an Indian design. Another simple yet effective invention…Kudos! That's just great. just imagine how this will change the life of labors. that's a great design, will help a lot to the workers at construction sites. Truly amazing! Why didn't we think of this before! Kudos @Vikram Dinubhai Panchal! "Mathyawarche jadd zaleyyyyyy oozheee"…..arey maag heee pushcart vapra….zakhasss..VCs r u listening? Excellent talent! "Lifesaver" for many people around the world! Rated -AAA +++++. aka The External Frame Pack… It's a nicely designed one, but its funny how "Old" is "New". Mine is 40 years old, made of aluminum, has the wheels but not the overhead, and the bottom folds out of the way when you need to store it. If you think this is great, check out "Eye In The Sky Screener!" This is awesome! Truly wonderful idea. But, I still doubt how this will change the conventional mindset of people. This is really the best design. It is cheap so a laborer can easily buy it and make his life much easier than before.